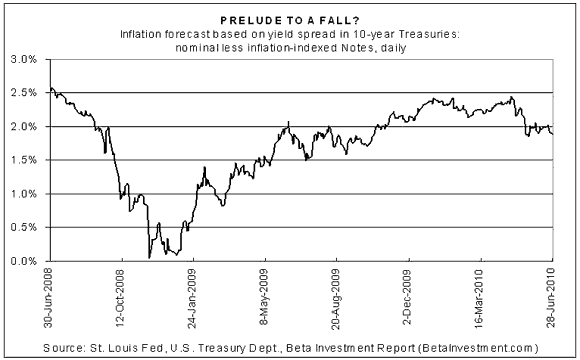 The Treasury market’s 10-year inflation forecast is slipping…again. That’s no surprise, given the renewed concerns of late on the deflation front (see here and here, for instance). Unsurprising, perhaps, but still troubling. The inflation outlook dipped to 1.88% yesterday, based on the spread between the nominal and inflation-indexed yields on 10-year Treasuries, according to government numbers. It’s unclear if this is an accurate warning sign that deflationary winds are set to blow stronger, but considering the economic climate of late it’d be short-sighted to dismiss the trend. As the chart below reminds, the market’s estimate of the inflation outlook slipped below 2% late last month, and it’s remained under that level ever since, save for a few brief but so far fleeting flirtations on the other side. Lower inflation is generally a good thing, of course, but until the economic signals are stronger—particularly in the labor market—the possibility of falling inflation at this point is a sign of trouble. The jury’s still out on what comes next, but we’ll know more in short order. On Thursday, we learn of the latest for the ISM Manufacturing Index, weekly jobless claims and construction spending. A more telling stat arrives on Friday, with the update on the jobs report for June. The headline number on jobs is expected to be negative, but the positive spin is that the trend in private payrolls is expected to show gains. Nothing less is required to counter the weakening outlook on inflation. Indeed, the jobs picture for May was disappointing and the hour is late for convincing the crowd that the labor market has some degree of sustainable upside momentum. Economist Scott Sumner argues that “the Fed suffers from the same sort of paralysis as it did in the Great Depression.” It’s hard to argue otherwise when looking at the annual rate of change in MZM money supply (M2 money supply less small-denomination time deposits plus institutional money funds). As the chart below shows (courtesy of the St. Louis Fed), the annual rate of change for MZM has turned negative recently for the first time since 1995. Unfortunately, we’re not in 1995 anymore.